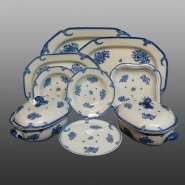 A partial dinner service printed in the Daffodil pattern. Meat drainer in the same Daffodil pattern, 15 inches in length. 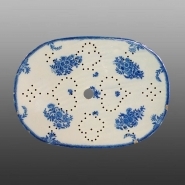 A molded earthenware game dish printed in blue in the Daffodil pattern. The pattern consists of floral sprays with daffodils on the border. No border was printed on this game dish, however the border can be seen on the partial dinner service shown below.